Bobby Brown, arrested two months ago for allegedly striking wife Whitney Houston, was sentenced to 60 days in jail Friday for violating his probation. Brown was more than halfway through a two-year probation stint passed down in January 2003 after he pleaded guilty to a 1996 drunken-driving charge. The 35-year-old R&B singer had been accused of five violations including a December misdemeanor battery charge in which police said Brown hit Houston, leaving her with a bruised cheek and a cut inside her lip. He's scheduled to appear May 5 in a Fulton County court on that charge. The other violations involve failing to take drug tests and pay probation fees. Brown also had been accused of failing to prove that he underwent counseling, completed his house arrest and fulfilled other obligations. On Friday, Brown was able to show he'd paid the $105 fees, had gone to counseling and had completed his community service. That was enough for State Court Judge Wayne Purdom to cut his sentence in half, from 120 days to 60 days. "Since you did complete most of the original conditions, I don't feel obliged to sentence you to 120 days," Purdom told the singer. There was no mention of the battery charge during the hearing. Brown thanked the judge before being quickly escorted to jail. Houston, the Grammy-winning pop singer, didn't attend the sentencing. Brown's family and attorney said they didn't know why she wasn't there. Afterward, his mother, Carole Brown, said she thought the judge was "very fair." She added that she'll support her son when he completes his jail sentence. "I will support him in all his endeavors, and I'm sure they are all going to be positive," she said. "He's not a bad boy, Bobby Brown." 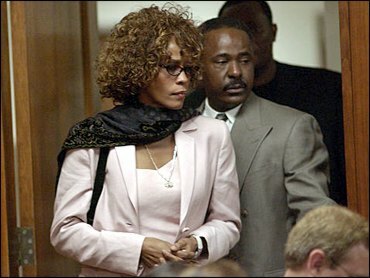 Brown's attorney, Vincent Dimmock, brought a suit for the singer to wear, but the judge wanted Brown to be treated like an ordinary prisoner. Brown wore the standard orange DeKalb County jumpsuit to the hearing. The singer will get credit for the week he has spent in jail since Feb. 20 when his attorney asked that his probation-revocation hearing be continued. Dimmock, who's also R&B singer Faith Evans' attorney on drug charges in Atlanta, said he didn't challenge Brown's sentence because it could have been worse. Because Brown had violated his probation, the judge could have put him in jail until January 2005, when his probation is set to expire. This marks the second time in six months that Brown has been in jail. He served seven days in the DeKalb County jail last August for a probation violation. Brown and Houston, 40, have been married since 1992 and have a 10-year-old daughter, Bobbi Kristina. Brown left R&B group New Edition in the late 1980s for a solo career. His hits include "My Prerogative" and "Every Little Step," but he has become more famous for his numerous brushes with the law and his turbulent marriage with Houston. The couple lives in the Atlanta area.